Flying Cars have been in the offing for years now- and no sign of them ever eventuating. However, if you look elsewhere for signs of the future, they are many and varied. 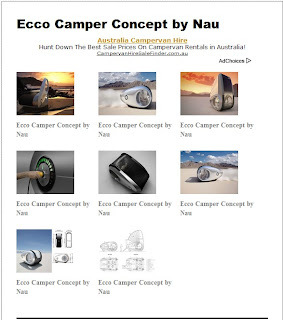 The new Ecco Camper doesn't fly, but it folds and unfolds like clean washing to create an environmentally friendly, spacious yet small and most importantly futuristic-looking campervan. The Ecco is 4.5 m long, and shaped somewhat like a teardrop. When stopped for the night, the top flips up and walls collapse, seats fold down to make it a comfortable and roomy living space. It is designed to sleep 5. An 8-hour charge will keep it running for 24 hours, and it has no emissions. The transport of the future! Keep an eye out for this slick-looking pod at a camping ground or holiday park near you!